And now, we will develop new projects and ideas integrating Scratch 2.0 and Arduino, the 2 true “champions” when we are talking about teaching electronics and code creation for children, educators, and beginners. There are few initiatives available on the web about Scratch 2 for Arduinos, being the most known the ones developed with a focus on kits supported by Scratch website like Lego WeDo, PicoBoard or the alternative mBlock, etc. Cool! So, what we will learn here in this tutorial is how to use Scratch 2.0 to program an ARDUINO to interact with our physical world! The above diagram shows all the sensors and actuators connected to our Arduino. But do not worry, we will go step by step on each component. As we know, Scratch is a great tool to teach beginners how to code, but before starting playing with Arduinos and electronics, I really recommend that you familiarize yourself with the Scratch 2.0 language, going to the Scratch Official Website and following some basic tutorials there. Doing that first will help you later to better understand how to use an Arduino on Physical Computing. More Blocks section: Where we will find the special blocks for controlling Arduino Pins. To use s2aio, we will need a Scratch 2 offline Editor, go to the link and follow the instructions and install it on your desktop. Also, download the Get Starting Guide for Scratch 2.0, so you can be familiarized with the editor. s2aio requires Python 3.5 to work. If you do not have it, please go to Python site and follow the instructions for proper installation. You can download it from MrYsLab GitHub. Follow the normal procedure to install this library in your Arduino IDE. Once installed, go on Examples/FirmataPlus/FirmataPlus on your Arduino IDE and open it. Now it’s time for the s2aio installation. Follow below instructions carefully. Once opened, go to “More Blocks” section. You will realize that now there are several new “black blocks”, which ones we will use to control the Arduino’s pins. Note that probably you will see a red LED on top of those new blocks. This mean that the Arduino is not connected with Scratch editor and that you must execute s2aio. In my case (a Mac user). I included a “batch file” with an icon in my desktop area, so I do not to open a Terminal any time that I want to execute s2aio. Give it a name (eg: s2aio_connect), save the script, set it executable. If you want to click it to run it, add ‘.command’ to the end of it. So, once s2aio is running, you will realize that the LED on “More Blocks” section is now green. That’s it! The above print screen shows everything as running on my Mac desktop. If you open a normal “new” Scratch 2 file, the arduino extentions will not be there. Let’s start connecting a LED to pin 13 of our Arduino UNO. Going to “More Blocks” menu, you will find the special blocks designed for Arduino. We will use 2 of them to create our Blink function. The first thing to do is to inform Arduino that a specific digital pin (in our case will be 13) will be [Enable] and should work as [output]. Drag this block to code area. 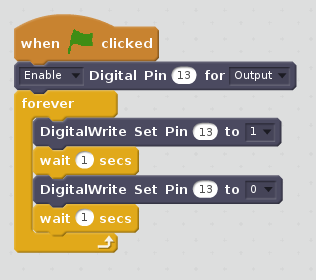 Note that at same block you can enter the digital pins number to be used and if this pin will be setting up as a  or . OK. Now, let’s create a real blink code using Scratch. if you run your code, you will see that nothing happens, or better, the LED will be ON and OFF so quickly that you will not realize it. So, you must some delay, let’s say 1 second after each block. The below screenshot shows you the final program and how I started the s2aio, this time using the Terminal. Each Sprite will be responsible for the initial setup of Arduino’s pins and to monitor or to act accordingly with its designated task. Also, each one of those tasks will be associated with a variable so we will not change the Sprite specific blocks anymore, independent of our program. On next step, we will start with the LED and I hope the idea became more clear. For starting, we will go to Data menu (orange) and create a new variable: “led”, that will work for all Sprites (this is very important). This variable will be set to “0” if we want the LED OFF and will set to “1” when we want the LED ON. Also, we will create a new Sprite going to the editor that we will name it “LED”. At the editor, we will create 2 different “costumes”: LED OFF and LED ON. Note that at this moment, when you run the program, clicking on GREEN FLAG, nothing will happen, BUT in fact, from now one you can set the variable led anywhere “1” or “0”, that the LED will follow! Let’s create a new Sprite, that will be whom will really do all the action for us. I will be using my little friend, MJRoBot for that. Associated with this Sprite (“MJRoBot”), we will develop our program blink never changing or touching again the Scripts associated with LED. Clicking on those blocks you will see that the real LED will ON and OFF. Again, try some changes, explore the code, associate the LED with animation. Install more LEDs with different names (variables), etc! Now, let’s explore a new component, that will be a LED connected to one of a PWM output, writing a script a little more complex to explore the potential of Arduino. For starting, we will go to Data menu and create a new variable: “pwmLED”, that will work for all Sprites. This variable will be set from “0” to “255”, what will make the brightness of the LED to change from minimum to a maximum. Let’s now create a new Sprite going to the editor that we will name it “pwmLED”. At the editor, we will create 6 different “costumes”, simulating different LED brightness. Follow the above diagram and add a new LED to our circuit. We must connect the LED cathode (the shorter leg) to GND via a 220 ohm resistor and the anode to our Arduino UNO pin 9. The Arduino UNO can provide on several of its pins, a PWM signal (Pulse Width modulation). See this link for more details: Tutorial/PWM. In short, you can “emulate” an analog signal using a digital output. The first thing to do is to inform Arduino that a specific pin (in our case will be 9) will be [Enable] and should work as [PWM]. Drag this block to code area. Change the value 255 for other values. You will see that with zero, the LED will be off and with 255, the LED will be on its maximum brightness. Try intermediate values and see what happen. As we did with Blink, the pwmLED sprite will be programmed having 2 specifics group of blocks, one for setup and another one that will run forever (in a loop), where we will monitor/actuate on its specific pin. Create our “main” function, that will “call” the “setup” function and activate the pin 9 with a PWM value and define which costume our sprite will have to simulate “brightness” on Stage (animation). When the pwmLED (Blue LED) brightness will be at its maximum, let’s turn on the led (Red LED) for 1 second. Let’s begin with connecting a push-button to Arduino pin 2. Follow the above diagrams and make the proper connections. From now on, we can go faster. You have already “catch” the idea! This block will return “1” if on the pin D2 we have a logical level “1” and “0” if it is a “0”. Drag both blocks to Script area and click first on the Enable block and after on the Read Digital block. Press the push-button and verify if the status changed (a “white balloon” will appear over the block with its value). So, let’s create a new variable “button”, that will be set up to “1” or “0” depending on the push-button condition and 2 new costumes for the new Sprite (we will call it Push-Button). Try it yourself and only after confirming with the code at bottom of this step. A great feature with Scratch that helps a lot when you are testing a code, is “to check” a variable (with a “v” mark) on the Data menu. Doing that, the variable value will be shown at Stage, as shown in the screenshots. Let’s Create a code associated with MJRoBot Sprite that will vary pwmLED from minimun (0) to maximum (255), but only during the time that Push-Button is pressed. Also, if the Push-Button is pressed, the RED LED (associated with led variable) must be ON. Try it yirsel before look the final code. After you have tried, you can download my version of the above problem. For learning how to use the Arduino analog inputs, we will connect an LDR, that is a Light Dependent Resistor on Analog Pin A0. But, what is an LDR? This way, the pin A0 of Arduino UNO will receive a signal varying from 0 to 5V. The Analog Pins of UNO are internally connected to a 10bits ADC (Analog Digital Converter), that it is a device that as the name explains, will convert the analog value to a digital value that can be read internally by the processor (10 bits ADC generates values from 0 to 1023). This block will return an analog value from 0 to 1023 if it is a “0”. So, let’s create a new Sprite (LDR) and a new variable “light”, that will a value depending on ambient luminosity. So, if we have a luminosity of 30%, for sure is the end of the day and we know what really means. We can generate here a generic block that will MAP an analog input, independent of the values that we have that will transform from minimum (Low) and maximum (High) inputs to a minimum and maximum outputs. and we will set our light variable with the return of this new map block. For more details about MAP, see seehere. Let’s go to our MJRoBot Sprite and use this new variable light, creating a simple code where if the light is less than 30%, we must turn on the Red LED (associated with variable led), if not leave the LED OFF. Spite of simple, this is exactly what happens with street lights, for example, that automatically turn ON at end of day. Create your code and see my simple solution after. Modify your code to automatically turn on an external light in your house (here the red LED) when is dark, but you only want to do this if you are traveling, so you will turn on or off your project, using the push-button. Think about how you must play with variables in a way that when you “press the push-button”, we keep its status. If we press it again, the status will be “toggled”. Let’s explore another sensor that also generates an analog output, the LM35, a temperature sensor. As we did before, we will create a new Sprite (LM35) and define a new variable, “tempC” that will receive the analog pin A1 value. The setup is similar to what we have done with LDR, only we will change (A) (0) for (A) (1) on Enable Analog Pin block. This block will return an analog value from 0 to 1023. Ops, but when you click on this block, we realize that the temperature is not really correct (it shows “39”, but I know that the temperature here in my lab is in fact 19oC). So, this is exactly what we are getting internally from A1. But what should we do have the variable “Temp” showing the correct Celsius temperature? When you click on it, the correct “19oC” will appear associated with variable “tempC”. Note that we at the final code will use round () to “round” the result of the calculation, taking out the value after the decimal point. Note that we are keeping the previous code, that will turn on the “red LED” if the light is lower than 30% and now we are adding an “alarm” using the “blue LED”, related with our variable pwmLED. Both sensors will work independently. In reality, the Arduino UNO has only one internal ADC that is multiplexing amont its 6 analog pins. So, its good not to have measurements imidiatelly one after the other. Its advise to have at least 300ms between measurements. Returning to our project, you can imagine it to be used to automatically turn on a fan or conditioner air equipment in your house (here the blue LED) when is hot. Put your finger over the sensor. You should see the temperature going up, firing up the blue LED. Create a code that will draw a “Bulb Thermometer”, where the mercury column will go up and down accordantly with temperature (see the above picture as an example). PIR sensors allow you to sense motion, usually used in home alarms to detect whether an intruder has moved in or out of the sensors range. They are small, inexpensive, low-power, easy to use and don’t wear out. For that reason, they are commonly found in appliances and gadgets used in homes or businesses. They are often referred to as PIR, “Passive Infrared”, “Pyroelectric”, or “IR motion” sensors. If you have a “movement” in front of the sensor, its will generate a 5V in its output and the Arduino will understand it as logical level “1”. With “no movement” a 0V will be at Arduino’s digital pin, what means a logical level “0”. You can “think” that the sensor is a “push-button”, what means that what we have learned before will apply to it. So, let’s begin with connecting the PIR sensor to Arduino pin 3. Follow the above diagrams and make the proper connections. This block will return “1” if on the pin D3 we have a logical level “1” and “0” if it is a “0”. Try it. As we did before, the variable, “motion” will take the D3 status. We will include it on the “Forever Loop” that is part of the “main” function. At this loop, we should test if there is movement (motion = 1) and change the Sprite’s costume properly. Now, let’s think about something useful to do with this sensor. As mentioned before, the PIR is commonly used on home alarms. If a person enters in your home, the sensor will detect it and will fire an alarm for example. In our case, this alarm is represented by the red LED. The code is similar to the one developed for the last sensors. Modify your code to automatically turn on an external light in your house (here the red LED) when is dark, but you only want to do this if you are traveling, so you will turn on or off your project, using the push-button. Think about how you must play with variables in a way that when you “press the push-button”, we keep its status. If we press it again, the status will be “toggled”. Also, now consider to include in the code the movement sensor. Those blocks will generate a square wave of the specified frequency (and 50% duty cycle) on a pin. A duration can be specified in milliseconds, otherwise, the wave continues until we use a noTone block. The pin will be connected to a piezo buzzer to play tones. Follow the above diagram and connect the pin “+” of the buzzer to digital Pin 6. You must configure the pin for tone operation by using the Digital Pin Configuration Block before using this block. Entering a duration of zero will leave the tone activated. Use the no tone command block to deactivate. Great! Remember our last step where we had a motion detector? let’s now associate a sound alarm (Buzzer) when an intruder is detected! On my example, I used 2 different frequencies to simulate an alarm. Try other ideas! A very interesting device that can be used for distance measurements is the “Sonar”. Here we will be using the HC-SR04 Ultrasonic Ranging Sensor. Basically, this device emulates what bats do for distance measurements. They emit an ultrasound pulse and count the time for an echo to be received back. Having the time for the Echo to reach back the sensor and knowing the sound speed (340m/s), we can by dividing it by 2, knowing the distance between sensor and obstacle (see above diagram). This sensor provides 2cm to 400cm of non-contact measurement functionality with a ranging accuracy that can reach up to 3mm. Each HC-SR04 module includes an ultrasonic transmitter, a receiver and a control circuit. On our case, s2aio developed their block taking in the consideration that the trigger and echo pins are wired together and a single wire is connected to an Arduino digital input. Note the above diagram, that both pins are together (jump on the breadboard) and connected to Arduino pin D12. The pin 12 should be enabled using the Digital Pin Configuration block, selecting Sonar mode. Sonar data is monitored using a Read Digital block. If you do the above, you will get the sensor working, BUT you will realize that sometimes, errors will happen (big or very low measurements). This is because other sound or echoes reflected on different obstacle can generate “false” responses to the sensor. One way to minimize this, it to create a temporary variable (“temp”), that will receive the reading from Digital Pin. We will only pass this value to our real variable “distance” IF the measurement is in between defined limits (see the above print screen). For example, I have setup an area to measure things that will go from a minimum of 3 cm up to a maximum of 40 cm. Great! Remember our last step where we developed a sound alarm with our motion detector? Let’s now associate the sound alarm (Buzzer) and a visual alarm (LED) when an intruder is detected but ONLY on distances less than 30cm (SONAR)! Try other ideas, like also incorporating the motion sensor (PIR) more LEDs, light, etc. Our last device to be included on the MJRoBot Electronic Playground will be a servo motor, using another special s2aio command block to set its position between 0 and 180 degrees. But before anything, Let’s build a “tower” where we will mount together with the Sonar and the 180 degrees Servo Motor. Doing that, we can point our sonar in different directions, using the servo. Follow the above photos as a suggestion how to build the tower. Having the tower fixed on a table (I used Scott tape), connect the servo cable on protoboard as shown at the diagram. There are only 3 wires, +VCC, GND and Data (usually orange) that must be connected to Arduino pin D10. The pin 10 should be enabled using the Digital Pin Configuration block, selecting Servo mode. If you do the above, you will get the servo working, BUT it is important to prevent that variable angle be defined by other Sprites with values out of servo range (in my case 20 – 180). So, we will make a “limitation” or “CONSTRAIN” the data angle, in a way that we will only move the servo if variable angle will be between 20 and 180. If the angle is lower than 20, we will keep it 20, same procedure for values over 180. See the above print screen to understand how I create this “constraint idea”. A good procedure will be create a dedicated and generic block for the “CONSTRAIN function”, same we did for MAP. Try it! Let’s create a “SWAP” function, where the servo will move in all directions. Let’s include the pushbutton, so the Servo will make the swap only when it is pressed. Now our MJRoBot Electronic Playground is complete. We have a Sprite for each one of our components. Each component has a variable associated with it. So, now we can define a project and work on its code only changing the Script associated with MJRoBOt or any other. The idea is not change the component sprites if the HW not changed. So, let’s create our first real project using the Playground. You will see that the Script area for our Sprite MJRoBot is empty. To create a new project, go to Scratch 2 Offline Editor File Menu and using “Save as” option name it: “Arduino_Radar_Basic.sb2”. Do not change the Base_Playground.sb2 file. The tower with Servo/Sonar will sweep an area looking for obstacles on a 40 cm range. If an obstacle is found on distance less than 10 cm, an alarm should be fired. The alarm should use sound and light. Let’s use our last project, the “Base Radar” and also include on it an animation that will show a “Radar Screen” on our Stage area. The Radar Screen will only a “background” and will be static. But the Radar Scanner will be a Line that will sweep the Radar screen from left to right (from 0 to 180 degrees), following the Servo Sweep. Be creative! Mix the sensors, including new ones! The sky is (not) the limit. After you learn about how to control “things” using an Arduino and Scratch 2, try doing the same using the Arduino IDE.